good fortune to automatically come to you. that everyone possesses but that few people use. Have you ever experienced a meaningful coincidence? You know, when you're thinking about something and suddenly it's there, right in front of you. You notice it and pay close attention. And you wonder how it magically appeared out of nowhere. Or you're thinking about how much you like someone, when suddenly you receive a letter or a phone call from that person. You enjoy your connection with this person, so much so, that you want to take in everything he or she has to say and then go over it in your mind long after your time together ends. You get that feeling of warmth and joy from this connection, and you want it to linger as long as possible. Well, I'm writing you today to inform you that meaningful coincidences are predictable and controllable, to the point where you can make them happen at your command. You have an innate, largely untapped power to create coincidental moments whenever you want them. This has been demonstrated over and over again in controlled experiments, and I intend to show you how you can use this new phenomenon of mind power to radically transform your life and the world around you. My name is Dennis Higgins. Not only do I intend to show you how to create these types of moments on a regular basis, but I also intend to show you how to make "miracles" happen every day, if you want. A Higher Intelligence gives you access to what you need to know so you can use the information to help others and make the world a better place. Learn to "access the Internet" of the UltraMind! Suppose you had a computer. It's a standalone computer and you don't have an Internet connection. Now, let's say this computer is your only source of information. When you need to know something, your only option is to access the "experience" the computer has had by opening one or more of its programs. But what happens when you need some information that's not on your computer? In this example, you're out of luck. This is how most people's minds operate. Their minds get all their information from the "computer" of their life experience, and that's it. If they haven't experienced something firsthand, then they can't get any information anywhere else. This is called a closed system, because unless you physically load a new program onto the computer, you cannot access any new information. But now let's say you connect that computer to the Internet. Suddenly, this one computer has access to vast storehouses of new information. Huge networks, supercomputers, and databases can be accessed. Nothing is off limits. Which of these two situations would you prefer? If your mind were like a computer, would you want it to be a single standalone computer, limited to what you have experienced physically with your senses, what you've heard, what you've been told, and what you've read? That's how 99 percent of the people on this planet walk around today. Or would you rather have access to the Internet, with unlimited storehouses of knowledge and information? You can get new information, send information, and you can hack into any single computer on the Internet, and even change the information that's on it. This Internet I call the Ultramind, or Higher Intelligence. Some call it the Universal Mind or the Cosmic Mind. Others call it the Super-Conscious Mind. Still others call it the Tao, or even God. But for the purposes of this letter, I'll refer to it as Higher Intelligence. By learning to access the Internet of Higher Intelligence, you'll be able to do things the average person would say are impossible. You'll be able to do what other people call miracles. But the truth is, although the results are powerful, they are not miraculous, because when you do them, you will be following the natural laws of the universe and not defying them in any way. So, by definition, the term "miracle" does not apply. Go beyond the limits of time and space! A man named Jose Silva perfected a method of opening up the vast Internet of Higher Intelligence and using it to make "miracles" happen. And over 5 million people have graduated from Silva Method training. I myself am a Silva graduate and trainer. Once, in Laredo, Texas, at one of the Silva conventions, I stepped away for a moment, and there in a restaurant was Jose Silva himself, alone at a table. I asked to join him, and he said, "Sure. Sit down." I said, "Jose, can you just sum this up for me?" I was a recent graduate at the time, and I wanted a better understanding. He took his finger, dipped it into a glass of water, and drew a line across the table. And he said, "On one side of this line is ordinary consciousness. That's how we all walk around. That's how we were taught by our parents to walk around. It's limited to our physical senses. "Now, on the other side of the line, that's where all the good stuff is. That's where you're not limited by time and space. That's where you can know what you need to know, when you need to know it." He continued, "We are stuck on the other side of the line. We are stuck in ordinary beta consciousness. But this program teaches us to stand with one foot on either side of the line. We can have a foot firmly planted in the material, and then we have the other foot in the spiritual dimensions. We can look into the spiritual world, view what needs to happen, see what problems need to be solved, identify what difficulties need to be changed, and then we can report our findings back to our material selves and bring about powerful change that makes this world a better place to live." It was a powerful conversation that still impacts me to this day. Because up until then I was led to believe that the world I perceived with my five senses was the only world there was. Certainly it was the only "real" world. But since then, my perception of reality has changed dramatically. If you were to go to Australia and talk to one of the tribal shamans there, and you were to ask him, "Which is easier, communicating with the world of spirit or punching some numbers into my plastic gadget here and talking to some other plastic gadget in New York? ", he would call the cell phone a miracle. But he would say communicating with the world of spirit was as natural as waking up in the morning. The shaman's "cell phone" hooks him up to Higher Intelligence, from which he learns anything he needs to learn that will help him in the material world. That's what he would call ordinary. He would say we were born with the capacity to do it. And today, in our modern society, we are finally coming back to that. Because what Jose Silva taught and what I teach is how to use this equipment you were born with so you can have more impact on the people around you and make the world a better place to live. Remote viewing and remote influence are especially useful in this regard. Let me tell you about one time in which I used them. YES, I want to have more control over everything in my life! A friend of my sister named Janice had a cyst in her abdomen about the size of a peach, and the doctors were going to cut her open and take it out. She didn't do well with anesthesia, and she didn't want to have the operation. I agreed to help only on the condition that she demand another examination before the surgery. So I used a Silva Ultramind concept called the Three Scenes Technique. I remote viewed her cyst, and I worked with it until I saw her perfectly well and fine, leaving the hospital with no operation. "Janice wasn't going to let that go, so she said, ‘Well, you felt it. Do you feel it now?' The doctor examined her and said, ‘No. Maybe it was gas.' "
So Janice walked out of the hospital with no operation because I had taken the time to remote view her condition and then remote influence it to heal. Now, your first reaction to that claim may be disbelief. That was my response when I first heard about how things like that could happen. But one of the most valuable lessons I learned early on was to just do the drills I was instructed to do without even thinking about whether they were valid or not. Because I was able to do that, a whole new world opened up for me. Since then, I've experienced many other successes in the area of physical healing, and I've done it using innate abilities every human being has. Now, my colleague John La Tourrette, Ph.D., has used Silva remote viewing and remote influence in entirely different areas than I have. John's been using the Silva techniques since 1980, and when he came across Silva back then, he had been practicing martial arts for 30 years. John didn't want to get spiritual at the time. He wanted to get smarter, faster, and wealthier. At first, John was very skeptical. But then he just did the drills he was given and discovered they worked. So he took what he learned and he used it to become a multimillionaire. At the time, John owned a small school of martial arts. After learning the Silva techniques, he was able to retire in six short years because he took that school and built it up and built it up and then he just retired. He wanted to get a doctorate. So he used the Silva techniques to choose the school he would go to and the professors he would study with, and to learn more quickly and effectively. After getting his Ph.D., John used Silva techniques to come up with martial arts products and sell them via ads and direct mail. In fact, one ad he wrote brought in $1.2 million in just one year. Not long after, John started opening up martial arts centers all over the country. He would move, open up the school, build it up for a year or two, and then sell it for a lot of money. Whenever it was time to sell the school, John would use Silva remote influence technology to communicate through Higher Intelligence that he wanted to sell his school. And every time, someone would approach him shortly thereafter and ask to buy the school from him. He didn't even know the people in certain instances. But Higher Intelligence still connected him to an eager buyer, and he made a fortune as a result. Wherever you are in life, you can use Silva remote viewing and remote influencing techniques to make the world a better place for yourself and everyone around you. 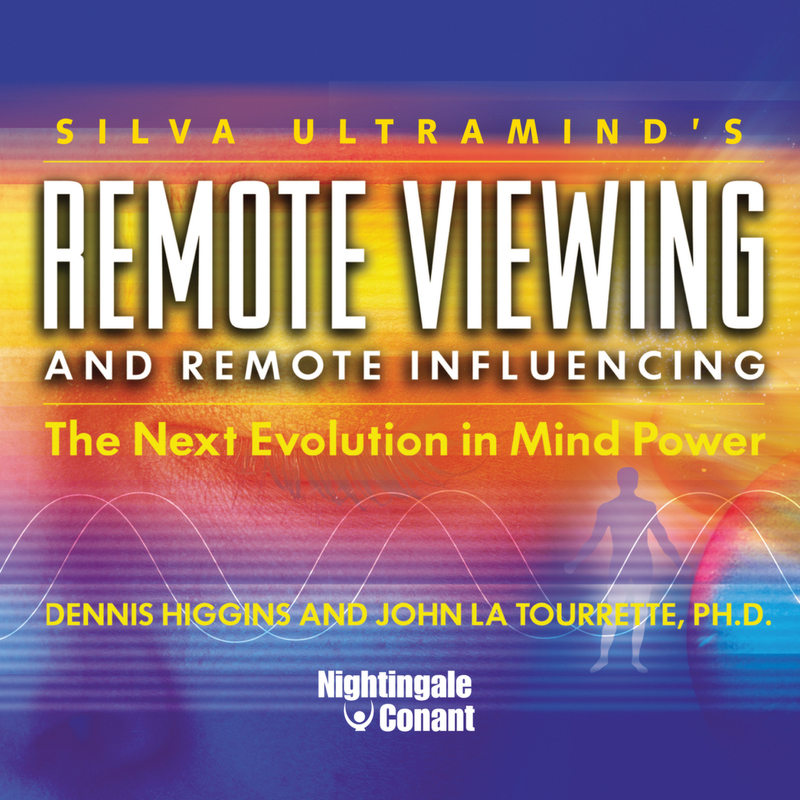 And in the audio program entitled Silva UltraMind's Remote Viewing and Remote Influencing: The Next Evolution in Mind Power, John La Tourrette and I will give you fresh new ideas for using remote viewing and remote influencing to transform every aspect of your life. Heck, I even use Silva remote viewing to prospect for gold — literally. Gold prospecting is actually a hobby of mine. What I do is, I practice first by laying down 15 square feet of tarp and telling my partner to put several pieces of gold under the tarp at random points. Then, using Silva remote viewing technology, I attempt to locate the gold pieces under the tarp by putting a rock on top of the tarp in the location I think the gold is. After some practice, I could consistently get within six inches of where the gold was. One time I was out in some gold fields with an old prospector who sort of liked me and was showing me how to prospect. He said, "Now in this stream, we want to go on the inside edge." I said, "You know, I think the gold is over there." And I pointed to a spot in the distance. And he said, "No, no, no. That's all wrong. If you want me to teach you, then do what I say." So we dug up his area, ran it through the machine, and panned it. There wasn't much gold at all. And he said to me, "Do you want to try your little hot spot over there?" I went over there, and out of that one little spot, in one five-gallon bucket, we got more gold than we got out of two pickup loads of dirt that we had processed during the day. With Silva UltraMind's Remote Viewing and Remote Influencing, there's no limit to what you can do. With practice, you'll start using more and more of your inborn talents and abilities. Then you'll experience coincidental moments and "miracles" more and more often. You'll find yourself in the right place at the right time. You'll say the right thing to the right person. When you think a thought and say, "You know, I need to talk to a certain person," the phone will ring within the next two days and it will be that person. You'll start to see these things evolve, and they'll become more and more a part of your life until finally you'll be able to take your intuition for granted. People will marvel at the things you do, while to you they have become everyday, ordinary occurrences. Learn the "email address" of Higher Intelligence! Wouldn't it be great to have the email address of Higher Intelligence? Wouldn't it be great to just send them an email and say, "Look, here's the problem I'm having. Could you please send me a solution from your vantage point — from a vantage point that knows and sees more than I can?" That's exactly what Silva UltraMind's Remote Viewing and Remote Influencing will give to you. If you want to know what someone else is thinking, these techniques will show you how to get that information. If you want to help your family get along better, this program will show you how to make it happen. If you want to make more money, this program will teach you how to do it — as long as what you do is legitimately helpful to others and makes the world a better place. Have you ever been frustrated by situations that were out of your control? When you practice Silva UltraMind's Remote Viewing and Remote Influencing, NOTHING will be totally outside of your control. You will be able to have an influence on everything you want to influence — financially, personally, physically, and spiritually. Don't you want to be able to do that? It's okay to be skeptical. In fact, I encourage it. But don't let that stop you from going ahead with this and learning more. Instead, I encourage you to just do the drills that are an integral part of the program, without imposing any sort of judgment on them. Then, all you have to do is witness the results and decide from there. I know you'll be pleased with what you discover. Everything you want to come to you and everything you do not want to come to you — all of it can be influenced. All of it can be accessed through the Internet of Higher Intelligence, and we will show you exactly how to do it when you order Silva UltraMind's Remote Viewing and Remote Influencing: The Next Evolution in Mind Power. Just imagine what you will be able to accomplish once you start using this information to broaden your circle of influence. More good things will come to you. You'll make more money. Your relationships will be happier and more fulfilling. You'll be able to make more of a difference in the world. If you don't take advantage of this opportunity, you will never be able to explore any of those possibilities. More than 5 million people have graduated from Silva training. Fewer than 1 percent have ever asked for their money back. That says a lot. And now you can get access to the most powerful information ever offered by Silva instructors. Take advantage of this chance while it's still available. P.S. If you act now, you'll also receive a FREE bonus recording featuring original, never-before-heard material from Jose Silva himself on Subjective Persuasion. This will broaden your knowledge of the most powerful techniques we teach in this program, and it will help make you a master of mind power. But you must hurry! This extra bonus is available for only a limited time. and easily do things the average person would consider impossible. Silva Ultramind’s Remote Viewing and Remote Influencing, at the special price below. - I can select one of two ways of ordering.